This adorable little bear is Forbe, he is named after an explorer. 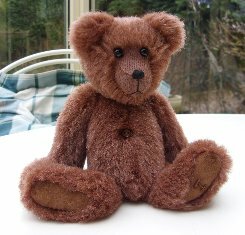 Forbe is 7" tall and is made of lovely soft, dense, russet coloured German alpaca. In style he has long curved arms, quite short legs with shaped footpads, a nice wide face with big shiny black German glass eyes and a black stitched nose. He has loose joints and a wobble head joint to give him added cuteness and he is very heavily filled with steel shot and steel balls. I really love this bear, I like his weight and I love the colour of the fur, not quite red, not quite brown, somewhere in between. His pads and paws are toning cashmere and he has a toning belly button. I hope you like him too. Forbe costs £60 plus postage. Please note that as with all our bears, Forbe is not a toy and is not suitable for children. Sorry - Forbe has been adopted.